This year we had the very great honour of welcoming Steve Baker to his UK homeland, fresh from his tour of India. 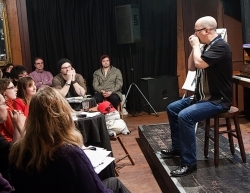 During a full programme of harmonica workshops, Steve offered his wisdom and expertise to a select group of advanced harmonica players, many of whom had travelled across the country to meet him. 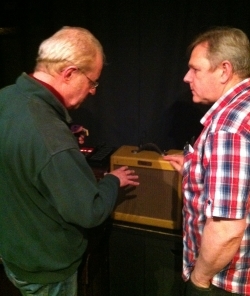 Meanwhile over forty newcomers attended the workshop for complete beginners with the Harp Surgery’s Good Doctor. The evening show featured the harmonicas of Darren Causton and Blues Deluxe (left), followed by Will Greener’s solo presentation. Darren delivered his five star brand of high energy electric blues, while Will barefooted into a Filisko milieu of fox chases, spirituals and vintage harping. You should find footage of all the evening’s performances at Oxharp’s Youtube Channel. 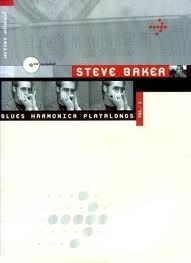 And that includes Steve Baker with Blues Deluxe. As you would expect, Steve’s playing was richer than Schlag Sahne. Like a harping Pied Piper, he led his spellbound audience on a musical Wanderung that ranged from Funky Mardi Gras to Soul Train, Off The Top and a reggae piece, One Drop Blues that brought back the spirit of 1970’s Rock Against Racism. In Hustle On Down, Steve demonstrated his mastery of country harping technique with a turn of phrase to make Charlie McCoy sound pedestrian. The centrepiece of Steve’s performance was Doublecrossed And Blue. For the Good Doctor this was a special moment. Together with William Clarke’s Blowing The Family Jewels, this is the Doc’s all-time favourite piece of third position harping; a piece that should be studied by any serious harmonica player. It is quite simply seminal. Witnessing it played live was a privilege. 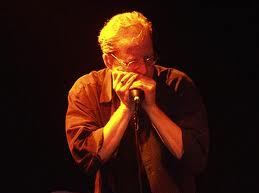 Doublecrossed And Blue first appeared on Steve’s Blues Harmonica Playalongs Vol.1 and it was later re-worked on his 2009 album, Gotta Look Up, with Chris Jones. You can still find copies of this excellent tutorial on the internet (if you’re not a German speaker, make sure it’s the English language version before you buy). Steve plays the piece on an A major diatonic harp. Playing in third position, this means the band is in B minor. 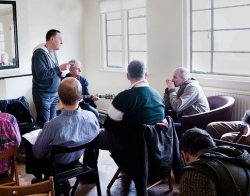 At Harpin’ By The Sea 2013, Steve explained that the piece was originally recorded as a studio guide track for his band. He had every intention of finishing the job later, particularly as he felt he’d hit a bum bent note at the end of the second passage. What he was referring to is the sustained third draw bend in hole 3. You will find the passage at the start of this post. On the low end of a harp, the descending third position blues scale is 4D 4B 3D” 3D”‘ 3B 2D” 1D. Notionally, Steve may have had 3D” as his intended note. He actually played the 3D”‘, but planned to overdub the passage later, or else run a full retake of the harp line. On hearing it through again however, he realised that what he’d already recorded worked perfectly. It may have been the wrong note theoretically, but his ears told him otherwise. He’d hit the mood of the piece perfectly. Steve did attempt some retakes for good measure, but somehow none quite recaptured the moment. 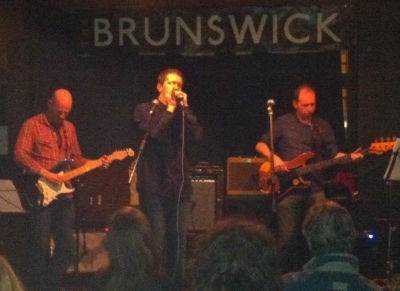 Just a quick comment……I travelled from norwich and home on Saturday and it was so worth the journey. 3 knowledgeable teachers for the advanced group including Mr Baker who technically we should kow tow to BUT Will made my day! For best part of 30 years I’ve played Chicago style blues without really opening my mind to the roots of it all. 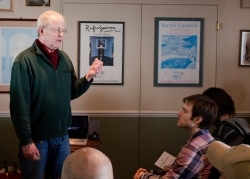 Will made my day by giving me a whole new direction to learn something new so…….thanks for the event it was terrific…and whilst we all learned something new and all took something personal home…..from me I’d like to thank shoeless Joe! ( Will! ). Thanks to you all and PLEASE let it happen again next year! I’d like to say a big thank you for a fantastic day. This was my first time at Harpin’ By the Sea and I’ll certainly be returning. A special thanks to Keith Charnley who ran a very helpful workshop for us improvers. I’m hoping to organise some lessons in Brighton coming over from Hastings but in the meantime are there any more photos of Keith’s workshop? – I know someone took a few. Thanks Peter, glad you had a good time. We’ll see if we can find some more shots for you. Brilliant stuff! A few overblows in there unless I’m mistaken!! Or was he playing a 12 hole Steve Baker A minor harp? Sorry, I’ll try again! I think it’s a G major harp he’s playing , with amazing control on the 2 and 3 draw bends! Brian…it’s in the text….Harp tab (C major diatonic, 2nd position). He’s playing in G, but it’s 2nd position on a C harp. I’m playing along on a G harp! It’s the only way to get the 3d”, 3b, 2d” 1d, 4d as he’s playing it on the video clip.